This is Part II of a series. See Part I. Part III coming next week! I have wanted to go to Maine for a very long time. People who have been there get this dreamy, far away-look in their eye when Maine is called to memory, so I knew there had to be something to it. I was not disappointed. On this very productive trip I crossed off a bucket list destination, hit two new states (Maine and New Hampshire), and collected another national park. Here are some more photos of the journey. I last left you when we arrived at Acadia National Park. See this rock face? We climbed it. Beehive Mountain. There were steel ladder rungs bolted into the side of the rocks making it, I won’t say easy, but easier to scramble up. We were enveloped by clouds at the top and could only just make out Sand Point. Sand Point when the clouds cleared. Amphitheater Bridge, crossing a stream in style. Way to keep it classy, Mr. Rockefeller. View from the Jordan Pond house, where we had a fantastic lunch and sampled the famed popovers. My husband and I first saw the Food Network show Chopped shortly after getting married. We were vegging in a hotel room, flipping channels, when we came across the show in all its intense, creative, culinary glory. We both sat bolt upright and said, “We must do this!” A few weeks later found us in our neighborhood grocery store, each armed with our own shopping basket, ready to befuddle the other. If you haven’t seen the show, here is how it works: four chefs are given four mystery ingredients with which they need to create a dish. There are three timed rounds–appetizer, entree, and dessert–and one chef is eliminated (chopped) after each round, leaving one victor at the end. Competitors can use anything they find in the pantry to create their dish, but they must include all four ingredients and impress the judges with their creativity, execution, and presentation. I highly recommend the show, even if you aren’t an avid cook. The show focuses on the creative process, and it is easy to get hooked. In our DIY version, we pick out four mystery ingredients for each other, with one of us assigned to an entree and the other to dessert. Anything goes in terms of ingredients, though the choice is tempered by knowing I have to eat this too. We don’t have a time limit because that would be neither practical nor fun. We go to the store and split up to look for the mystery ingredients. We reconvene and present the other with our devious choices. We then split up again, collecting anything we think we might need that we don’t already have in our fridge or pantry. Once at home, we get to work. I’m gonna brag a little now, so be warned: Josh once had me make dessert with dates, yogurt, raspberrry sauce, and CACTUS. Read: dessert with cactus. What would you do? I made whoopie pies! I whipped up a cactus mousse filling swirled with raspberry sauce and sandwiched it between two date cookies made with yogurt. I am still really proud of that one. Mystery ingredients: purple string beans, mizuna (Japanese Mustard greens, Spanish Chorizo, and goat cheese. Result: Chorizo papusa with a purple bean relish and a goat cheese crema. Mystery Ingredients: coconut flakes, toasted marshmallow-flavored hot cocoa mix, fortune cookies, and canned goat milk. We spent four days of our New England journey last week touring the Maine coast, including two full days exploring Acadia National Park. We bathed in cool waters of valley lakes and sunbathed upon the mountain tops. We hiked through conifer-speckled forests, up rock faces, and along bumpy, splashing shores. We enjoyed watching families negotiating directions to landmarks and bathrooms and struggling to get everyone to smile at the same time for the camera. Best of all, we breathed in cool sea air, a glorious respite from the Nashville heat. Here is a selection of photos from the journey. This is Part I. I will post Part II next week. Enjoy, and happy Friday! Now THIS is a city park. Let’s all move to Portland, ME. Feast: Lobster Roll, seafood chowder, lobster bisque, crab cake, french fries, corn on the cob. Camden from above. Mt. Battie summit. View from the Cellar Door Winery, outside Camden. Super awesome Penobscot Narrows Bridge near Bucksport. Next time we will pull over and check out the observatory at the top. We got ourselves this ornament. Maine. A road trip up the Maine Coast…doesn’t that sound nice? Doesn’t just the sound of the “Maine Coast” make you tingle with nautical delight? It should. I just got back, so I know. It is everything you want it to be. Especially the lobster. Oh, the lobster. Whole lobster, lobster rolls, lobster bisque–we had it all. And it was all splendid. Ironically, though, we found ourselves needing to defend our lobster love. In the audiobook we chose for the car ride, Jim Gaffigan’s Food: A Love Story, Gaffigan waxes emphatic on his detestation of all seafood (I know, I know–shame). Josh and I quickly transitioned from giggling along with the book to sitting quietly, stone-faced, as we listened to his uninformed and pitiful persecution of God’s gifts from the sea. Of course, he is right about some things; lobster resemble large insects–sea bugs, as he calls them–and are prohibitively expensive pretty much anywhere but Maine. There is also the disgusting matter of digging through their abdomen gunk and sinew desperately hunting for lingering shreds of meat. Apart from this, though, his protests fell completely flat. Lobster is fabulous. Period. In response to Gaffigan, I decided to write a poem about experiencing lobster. Enjoy. There you were, looking out, unaware. I stood in a tiny room. to a man with a pot, and the fire. One half hour to wait. Aroma of the ocean on a moonlit night. there was never going to be enough of you. You command all of my attention. You demand my deep devotion. I live in the moment for you, which is saying something. 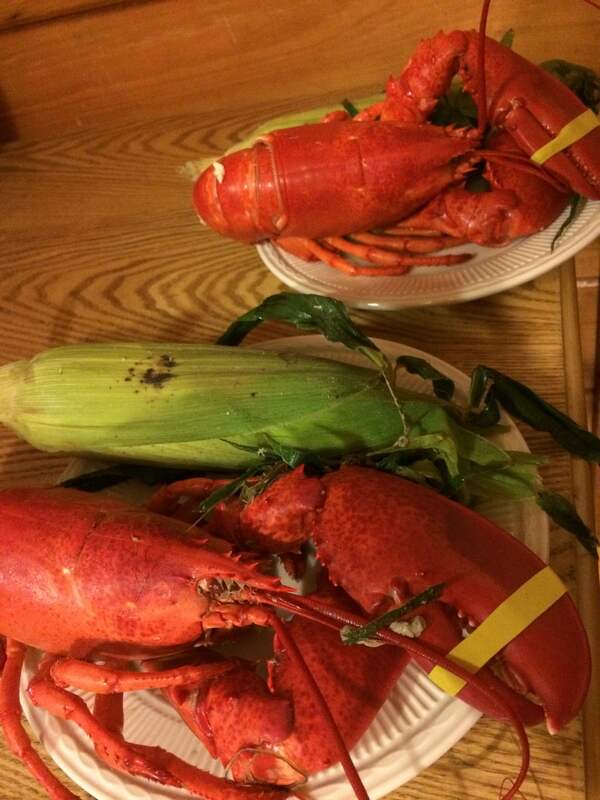 Lobster, Lobster, you did not die in vain.